Looking for Things to Do in Birmingham This Summer? 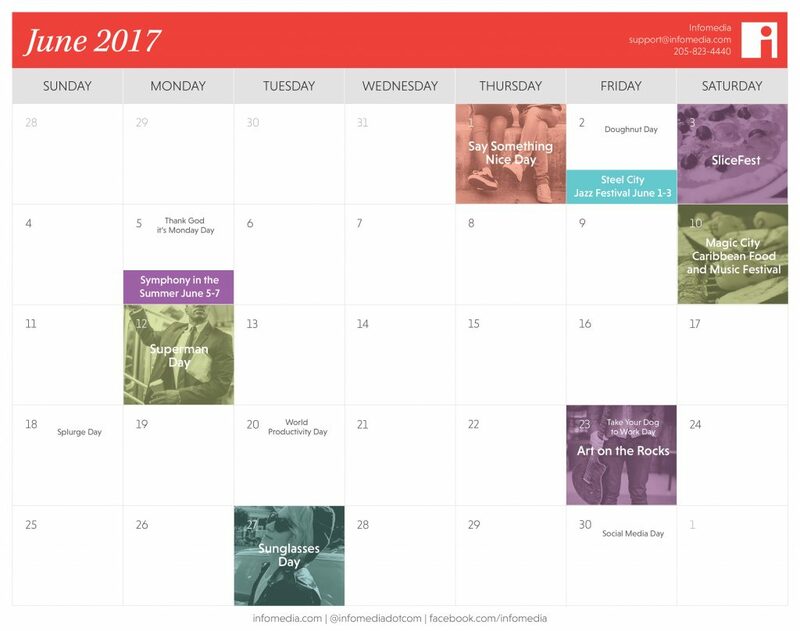 Download Our June Calendar! | Infomedia, Inc. Does work have you stuck at your desk? Are you dreaming of a carefree summer vacation in an exotic locale? Even if it’s not quite time for you to hit the road for an extended period, there’s no reason why you can’t put a super summer stay-cation right here in Birmingham on your calendar — or incorporate some fun in your own cubicle/office. If you’re looking for content to jazz up your blog or social media plan this month, look no further. Beat the heat (and the blog writer’s blues) with these cool events. Birmingham’s cultural scene heats up during the summer months with two signature events. The Birmingham Museum of Art’s popular Art on the Rocks series returns June 23. Makers, artists, movers and shakers will enjoy everything from contortionists, Bollywood and breakdancing this season. If you need a little bit of Mozart, Verdi or Bizet in your life, pack a lawn chair and snacks for the Alabama Symphony Orchestra’s free (!) Symphony in the Summer program at Railroad Park (June 5-7). Why not bring the fun to your office by celebrating one of several “silly” holidays? Doughnut Day, and Take Your Dog to Work Day are two we enjoy year-round. And wouldn’t it be a better world if every day were Say Something Nice Day? Our June calendar download is here to inspire fun content for your blog, brand or business — whether you get out and about around Birmingham or make your own fun at the office. Download it for free today, then schedule your content (so you can get in on the fun).